Consistency and persistence have been the key to success for the team responsible for implementing the admissions Medication Reconciliation (MedRec) process at Niagara Health. 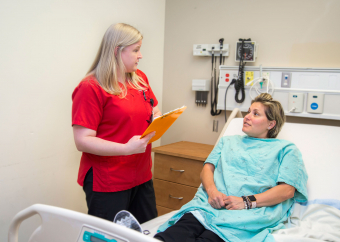 The goal of medication reconciliation on admission – one of our strategic plan initiatives – is to obtain an accurate medication history of every patient and ensure it is reconciled by their most responsible prescriber during their hospital stay. Providing a complete medication history includes sharing medication names, strengths and dosages of all prescriptions, over-the-counter medications, vitamins, supplements and natural remedies. We measure our success by the proportion of patients who have their medications reconciled. Since introducing Medication Reconciliation in December 2015, performance has improved from 12.6 to 90.5 per cent. "MedRec’s success is truly based on a collective effort from our multidisciplinary team," says Susan Cubelic, Niagara Health’s Director of Pharmacy and MedRec Initiative Lead. "Together, we are working with our patients to gather a list of their home medications to ensure their essential medications are continued in-hospital. Medication reconciliation is an important element of patient safety." Earlier this year, Health Quality Ontario highlighted our accomplishments in medication reconciliation through their online learning platform, Quorum, which is dedicated to improving the quality of healthcare.